Painting and Decorating tools, tips, chat and how to videos. : Pure bristle or Synthetic brushes? The brushes i used as an apprentice were pure bristle and to my shame i don't recall the various brands we used! i do however remember cleaning them dozens at a time, they were stored in water filled buckets, white brushes separated from coloured by a small piece of plywood, to use a brush we selected our weapon and shook out the excess water more often than not the stocks would be filled with water and you had to hold the brush upside down to drain out the liquid! if the stock was not watertight then we were told to rub some putty into the join where the handle was attached to the metal ferrule to prevent water re entering the stock. Not ideal i know and now I'm glad we have the vapour box storage systems, this brings me to synthetic brushes i must admit i was never a quick convert to these until recent developments in acrylic paints means care full brush selection is essential for the modern decorator, my own preference is for the Wooster chinex range for acrylic gloss and satin application, the proform picasso 2" for emulsion paints along with the firm action Wooster extra firm range. My first foray into synthetic tools was the purchase of the Purdy 2" dale elite i was as they say an instant convert and managed to wear this brush to a stub, still got it but it looks a little weathered. As for pure bristle they still have a place in my tool kit and i prefer the absolute quality of the Hamilton perfection range i use them for oil based paints and they store for months without any problems in my vapour box no water filled buckets any more! 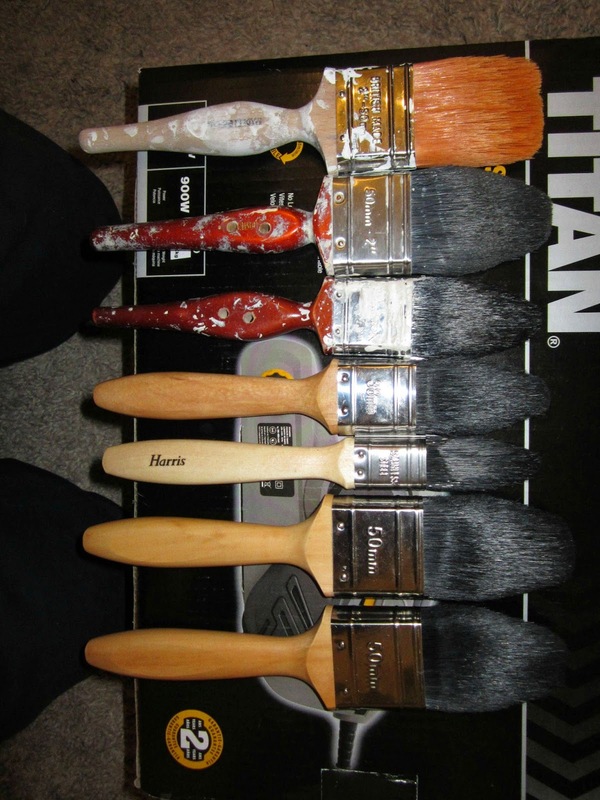 Have you ever waned to trim down your own paint brushes for use when cutting in? 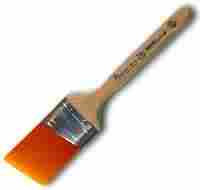 I needed a specific shaped brush for painting some georgian style windows the problem was the only worn down brushes i had that would do the job with speed were absolutely clogged up old pure bristle brushes which had seen better days! Now i had heard other decs tell stories about how they could set fire to a new brush and reduce the splay of bristles to create a decent cutting in tool, sounds drastic and it was i tried it and the smell was atrocious. After i managed to extinguish the fire there wasn't a lot of bristle left! well i was determined not to give in and bought a box of 50 pure bristle brushes to practice on and set about trying to solve the problem. I must admit i almost gave up trying! using various methods and some of them were bizarre including chopping with scissors, using chemicals, power drills with brushes cobbled onto the ends, running the brushes up and down rough brick walls and stucco surfaces. I even started to consider building a contraption that would attach to the back of a moving car which would then wear down the brushes as i drove around, seriously i was a man obsessed. How could something so simple be achieved? after all simply using the brush for months or years even could create the perfect cutting in tool its a solution but still left the problem of a tatty brush! Well as often with a problem the solution is in plain sight and it was. When you find out how to do this you will kick yourself as i did i could'nt quite believe i had solved the problem Eureka! Now what do do with it? Easy i produced a nice set and selfishly began to use them in all sizes. I also began to realize that these tools were fast and saving me so much time in fact they were making money! by speeding up some of the more tedious jobs cutting in windows as an example is the obvious one . I began to use my brushes in larger sizes and started to replace the use of mini foam rollers on large surface painting tasks. using old worn down brushes is nothing new! but using a "new" worn brush was doing some pretty clever things! So instead of only using these tools for cutting in i began to use them in a more general way, certain shapes of brush can be used to lay on paint with very little flip flapping to spread the paint, again we are saving time! Fast forward a few years and after some family difficulties i got back to my trade and with a nice armoury of brushes my job was indeed a lot easier, anytime i needed a new tool i just made one. I would buy a suitable brush trim it down wear it etc and away i went. The popularity of synthetic brushes was on the rise and as with any new products after a time i began to use these too, again i'm wondering if i could trim my synthetic tools down and how would these work and perform? The method of trimming these is slightly different but it works all the same. The better quality the brush the modification process is simpler its the same with anything you buy! choose a good brand with a thick stock its really not a good idea to trim a thin stock synthetic filament it can be done but they don't work as well. These kind of brushes work well at their intended use, i use them too! but would struggle to use them in oil based paints. It was a natural progression to make my finished brushes available to other decorators and diy enthusiasts so with this in mind i began to dip my toe's into online selling of my modified brushes. The interest has been quite staggering and has taken me by surprise! I now sell my brushes on ebay they sell at cost plus a nice mark up and the feedback i recieve not to mention repeat orders keeps me busy, but above all my love is for painting and decorating i love my customers and most of them i now consider friends. I enjoy buzzing around in my van working locally and i want to concentrate on that. So i have created a video which gives anyone interested everything you need to know to be able to modify and sell your own creations however you wish. You might not be a decorator but that would'nt and shouldnt stop you being able to do this and earn some money. The secret is now available! am i going to make millions? i doubt it! be nice though! My next project is to register some new designs on some brush shapes i have created and to take these forward and make them available and also concentrate on film making all about painting of course! The video below will take you to my youtube channel instone09 where you will find my brush trimming tutorial videos free to view. "Best buy any Decorator could buy! No more wearing in new brushes!! Yayyy! Thanks"
Heres a set of brushes one of my video tutorial buyers has sent to me NOT JUST ONE BUT A FULL SET!